Due to the nature of non-linear LED performance, Solid State Lighting (SSL) design engineers always need to select between a variety of LED packages and electrical and luminous performances to optimize the lighting system. This can range from maximal performance to maximal cost effectiveness. Since LEDs are a current driven device, its efficacy (lm/W) peeks when the forward current is at its lowest and gradually decreases when the forward current increases. An SSL fixture’s output luminous flux can be considered as the integral sum of individual LEDs’ luminous flux. If a specific lumen target is fixed, fixtures can be designed with more partly driven LEDs to meet a high efficacy requirement at a higher cost and alternatively, designed with less fully driven LEDs to meet a cost target by sacrificing efficacy. However, between these two extremes, there lies a sweet spot called the crossover point shown in figure 1. Due to the complexity and unlimited choice when comes to designing an LED fixture, SSL design engineers usually cannot select the perfect constant current LED driver and must come to a compromise with what is available. To allow more freedom to SSL designers, Aimtec provides an optional output current adjustment solution (50%-100% output current adjustment) for LED drivers to meet the required potential design specification. 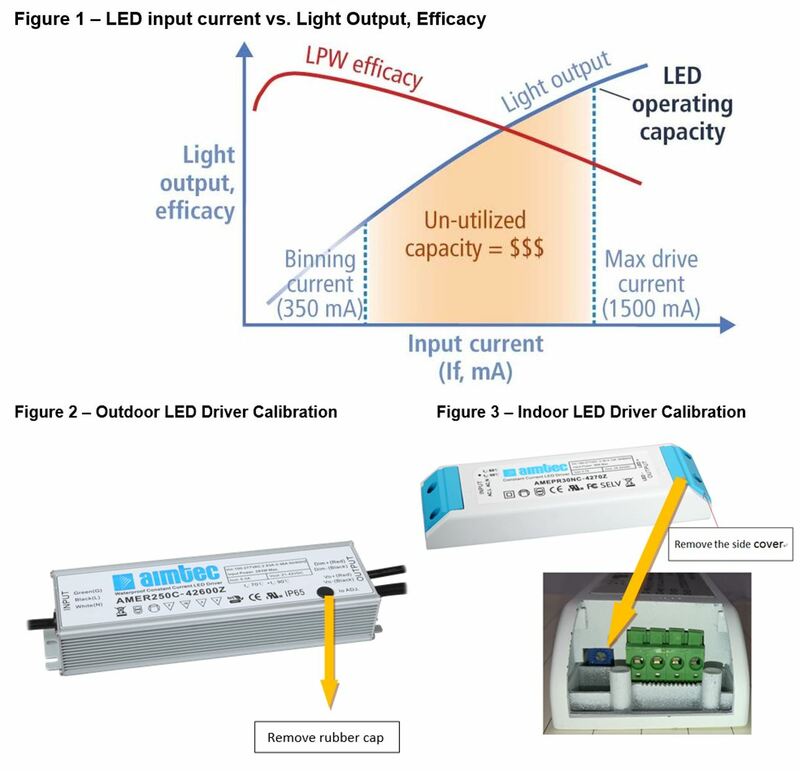 Both of Aimtec’s indoor and outdoor LED drivers have optional output current calibration potentiometers. The potentiometer’s location is shown in figure 2 & 3. To adjust the output current, the LED driver should be connected to an actual LED load and the current meter must be connected in series. Once the driver is powered up, the output current can be decreased by rotating the potentiometer counter-clockwise and clockwise for an increase. Once the desired current has been adjusted, glue should be added to hold the potentiometer in place permanently.